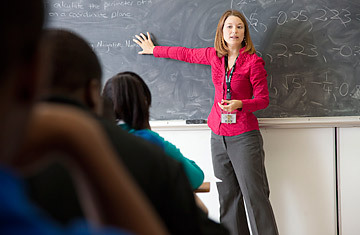 Katherine Poandl teaching a math class at Hamilton High School in Memphis, TN. I was very fortunate to have had a handful of gifted teachers during my years in school. Their passion for their subjects  literature, history, writing  was inspiring. But their most important attribute was not that they taught what to believe, but how to learn  not what to think, but how to think. For our fourth annual national-service issue, we have examined the problems of public education, specifically why it's so hard to find the teachers we need. I believe that teaching, particularly for K-12, is a form of national service and that the importance of what teachers do for our democracy is hard to overstate. At the same time, though, we can praise our teachers while realizing that we're not doing a very good job of preparing young Americans for either the responsibilities of citizenship or the workplace. As a country, we're spending more than twice as much per student than we were in 1971, and we rank 25th among industrial nations in math. Something's not right, and everyone knows it. Our cover stories by Amanda Ripley and John Cloud come at an inflection point for public education in America. The combination of falling test scores, rising dissatisfaction among parents, a difficult and more competitive global economy, a new crop of dynamic education innovators and an Administration that is actually willing to listen to them might just lead to real change. Ripley's story uses the much-talked-about new movie Waiting for "Superman" as a vehicle for examining why the quality of public education in the U.S. is so uneven and whether new endeavors like charter schools can be a catalyst for positive change. Cloud's story looks at all the new ways that people, especially those looking to change careers, can become teachers and whether these programs actually work and are scalable. In both stories, we see how innovative organizations like Teach for America, KIPP schools and the New Teacher Project are helping to revitalize public education. And Andréa Ford's roundup of volunteer opportunities offers links and information about how anyone from recent grads to senior citizens can pitch in. Finally, this entire package, which was conceived and edited by senior editor Julie Rawe, is launching on the same day that Time.com will begin a weekly education column called School of Thought, by Andrew J. Rotherham, the Eduwonk blogger and a co-founder of Bellwether Education Partners, a nonprofit working to help low-income students. TIME's interest in education is long-standing, and because we think this is such a vital issue, TIME will partner with the Carnegie Corporation of New York and our parent company, Time Warner, to host a national summit of thought leaders on higher education next year. The idea is to look at what's working and what's not, at a moment of great challenge and change in higher education. It's an honor to work again with Vartan Gregorian, the head of Carnegie, who helped us launch the national-service summit in 2008. Vartan has been one of America's outstanding advocates for maintaining the nation's pre-eminence in higher education. Finally, in keeping with the theme of this issue, just as students return to the classroom, TIME will be donating 10,000 subscriptions of TIME for Kids to low-income, high-need schools. See "Exclusive Interview: The Obamas on The Meaning of Public Service." See "21 Ways to Serve America."